or Moneygall is mentioned in the news.. WHY? Well, they talk about the Irish Diaspora where Irish people emigrated long time ago, and they then develop an interest in their ancestry and heritage. As it happens, President Barack Obama’s roots are traced back to Moneygall, and as he’s planning to visit his ancestral home ( yes, it does go back quite a few generations!) in May. So where is Moneygall? Moneygall is a small village on the Tipperary/Offaly border, Ireland, on the M7 route between Dublin and Limerick. 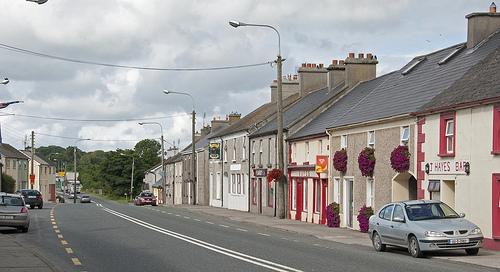 Like many other small villages, Moneygall is bypassed by a motorway, but it seems with today’s announcement that Supermac’s will invest 7 Million Euros in a travel plaza (which they(aptly) hope to call Obama Plaza ), the only way is up for Moneygall! Could you tell me if there are any campsites in the area for the weekend of President Obamas arrival?